Mary Seacole was a controversial figure during the Crimean War and continues to be controversial today, more than 100 years after her death. Scholars may not agree with her unconventional life and methods of nursing, but all would agree that she was a dedicated nurse who alleviated the suffering of many. 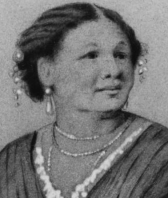 Mary Seacole was born as Mary Jane Grant in 1805 in Jamaica. Her father was a Scottish officer in the British Army, and her mother was a free Jamaican Creole who was a healer. She ran a boarding house that housed many disabled soldiers and sailors and others who suffered from yellow fever. Seacole was an eager student of the healing arts and learned much from her mother, including the use of herbal remedies. Seacole's formal education was provided at the home of a patroness with whom she lived for a number of years. Between 1821 and 1825, Mary visited London several times until she returned to Jamaica to nurse her patroness through her final illness. After this, she returned home to work with her mother and occasionally helped care for patients at the British Army Hospital as well. She always had a love of traveling and during this time, she traveled to various places in the Caribbean, including the Bahamas, Cuba and Haiti. In 1836, Mary married Edwin Seacole in her home town of Kingston, Jamaica. He was a merchant and they opened a supply store, but it did not do well, and they returned to her mother's boarding house in the early 1840s. Several personal tragedies followed in 1843 and 1844, leaving Mary alone and grieving. In 1843, the boarding house was destroyed by fire, and then her husband and mother both died in 1844. Bravely, Mary began to manage her mother's rebuilt hotel, the New Blundell Hall, and later treated patients in the cholera outbreak of 1850. In 1852, while Seacole was visiting her brother in Cruces, Panama, there was an outbreak of cholera. Since there was no doctor there, Seacole took the responsibility for treating patients and saved many lives although, at first, many did not want to accept her treatment because she was a black woman. Contrary to the belief of the time, she thought the disease was contagious and worked to improve sanitary conditions. Later, she went to Cuba and treated cholera victims there. Seacole returned home to Jamaica in late 1852, but felt she was a victim of racial discrimination when she tried to book passage on an American ship. She had to wait for a later British ship. Once back in Jamaica, Seacole was asked by Jamaican officials to care for those suffering from a severe outbreak of yellow fever. She organized a nursing service at Up-Park Camp Hospital and found fellow African-Caribbeans to care for the patients. In early 1854, Seacole returned to Panama to take care of business affairs, and it was there that she became aware of the escalating Crimean War. She heard of the unsanitary conditions and the cholera outbreaks and decided to volunteer as a nurse. Meanwhile, the British Secretary of State for War contacted Florence Nightingale and asked her to organize nurses who would go to the overcrowded hospitals. Seacole traveled to England with letters of recommendation from doctors, but her applications to join the nursing staff were refused by everyone in authority, including an assistant of Nightingale. When she applied to the Crimean Fund for money to travel to Crimea, she was refused as well. Seacole could not help but think that this was racial discrimination since other black women also were not accepted. Her determination to help the soldiers was so great that Seacole, at the age of 50, paid her own way to Crimea taking supplies and medicines. Since her help was refused at the Nightingale hospital, Seacole found a site just a mile from the British headquarters and built a structure that she called the British Hotel. The first floor was a restaurant, and the second floor served as a treatment area and was similar to a hospital. She financed her endeavor by selling supplies and serving meals and alcohol, using this money for the care of the ill and injured. She would treat those with medical conditions each morning and then travel to battle lines to treat casualties. Her efforts were noted and praised by the local officials and military officers. She continued to do this for the remainder of the war that ended in March 1856. After the soldiers left, she was left with many bills and unsold provisions and was one of the last to leave Crimea in July 1856. Mary returned to England in ill health and bankruptcy. Because of her war service, the British press advertised her plight, and many people donated to a fund for her. Even though Florence Nightingale was somewhat critical of Seacole's work, it was said that she was a secret contributor to the fund. Further fundraisers were held, including the Seacole Fund Grand Military Festival that was a huge event but raised very little money for her. Seacole wrote an autobiography in 1857, the first ever written by a black woman in Britain. However, it was criticized by some as an embellished account of her life and not really written by her. Whatever the truth is, it is an interesting look at conditions during the time of the Crimean War. War correspondent, William Howard Russell, wrote the preface to the book in which he praised her dedication and courage in caring for the sick and wounded. By 1860, Seacole returned to Jamaica and was again short of money. More contributions were made to the Seacole fund, and she was able to buy land and build a house. She was interested in providing medical care during the Franco-Prussian War in 1870 but was unable to do so. She died in London in 1881. It is impossible to think of Mary Seacole without comparing her to Florence Nightingale. They were contemporaries who both made great contributions to nursing but in entirely different ways. Nightingale's strength was in the organization of nursing while Seacole's was a practical, hands-on approach. Nightingale's name has gone down in history, but Seacole's was forgotten for many years and is just being rediscovered. Mary Jane Seacole had to work to overcome prejudice, but by using her talents, skills and energy, she finally earned her place as one of the famous nurses in history. Her methods may have been unorthodox, but she reached her goal as a healer. She stands as an inspiration to all nurses today.